Not everyone is interested in teaching prenatal yoga classes, but chances are, if you’re offering asana classes that are open to the public, you’ll find yourself teaching pregnant students at some point. So it’s important to learn a few basic, supportive asana variations that you can offer to make practice more accessible and more enjoyable for them. 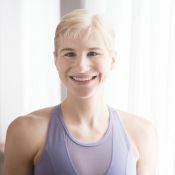 For the most part, if a student had a regular asana practice pre-pregnancy, she can continue to practice in the way she’s accustomed to as long as she feels comfortable doing so. This means that while you absolutely want to be prepared to offer suggestions and support to pregnant students, there’s no need (for example) to insist that a student practice a side-lying savasana if she’s perfectly comfortable lying on her back (more on this later), or to freak out if an advanced student decides to press up into urdhva dhanurasana (upward bow) or indulge in a brief handstand at the wall. Of course, pregnancy is not the time to learn challenging asanas like these, and for almost all pregnant people, big backbends and hand-balancing won’t feel awesome after a certain point (which means it’s time to stop doing them). While there are certainly some general guidelines to adhere to, modifying a practice for pregnancy isn’t about enforcing a rigid list of do’s and don’ts. There’s no need to hover over pregnant students, or to tailor the entire class to one person, but as teachers, we need to be mindful that we aren’t treating moms-to-be like they’re invisible, either. Keep in mind that no two pregnant students are exactly alike (just as no two non-pregnant students are exactly alike). This not only means that a particular modification or pose variation might feel wonderful for one student and not so wonderful for another, but also that some students will need and/or want more suggestions and support than others. Above all, remember that pregnant people are, you know, people. There’s no need to hover over pregnant students, or to tailor the entire class to one person, but as teachers, we need to be mindful that we aren’t treating moms-to-be like they’re invisible, either. That’s why even if you have zero interest in teaching specific prenatal classes, it’s still wise to learn a little something about pregnancy yoga—so you don’t freak out or check out when a student informs you that she’s expecting. Avoid or modify poses that compress the belly. Compressive “closed” twists—i.e., twisting toward the front leg side (in an asymmetrical standing twist like a lunge), or the bent leg side (in a seated twist like ardha matsyendrasana)—should be avoided for the same reason. Offer “open twists” to pregnant students instead. This basically means “twist in the direction opposite to that of everyone else.” Pregnant students should also focus on opening up through the chest as they twist, not twisting from the belly. During pregnancy, the hormone relaxin increases flexibility (the name itself is a bit of a giveaway!) and helps to prepare the body for birth. Because this influx of relaxin causes the ligaments to become more lax, pregnant students should take extra care not to overstretch. This can lead to pelvic and joint instability and/or pulled ligaments (which take a really long time to heal). To avoid overstretching, students should focus on strength and stability more than flexibility during pregnancy. This is especially important to keep in mind when it comes to hands-on adjustments. As a general rule, avoid giving “deepening” assists to pregnant students (i.e., assists that help them to experience a deeper stretch in an asana), and offer stabilizing assists instead (such as rooting a student’s pelvis in tadasana, or stabilizing her back leg in side angle). To avoid overstretching, students should focus on strength and stability more than flexibility during pregnancy. 3. What’s the Deal with Inversions, Anyway? During pregnancy, as one’s center of gravity shifts, lower back pain is a common complaint, and as teachers, we’re likely to notice extra-archy lower backs (excessive lumbar lordosis) in many of our pregnant students. Though it may seem like a quick tail tuck would be just the solution, more often than not, that instruction can be problematic, especially during pregnancy! Until fairly recently, I regularly used tailbone-centric instructions when working with pregnant students, but would often become frustrated when I saw that even though my students were doing exactly what I’d asked them to, my verbal cues weren’t really having the desired effect—their pelvises would be really tucked under, yet they still appeared to be collapsing in their lower backs. Their pelvises would be really tucked under, yet they still appeared to be collapsing in their lower backs. Eventually, I learned from my wonderful, wise teachers and mentors that excessive lordosis and an excessively tucked pelvis are not mutually exclusive (which explains why I would often see the two go hand in hand). Often the “extra-archiness” will be in the upper part of the lower back, and an action in the pelvis (like tucking) isn’t really going to make much difference. Combine this with the fact that chronic tail tucking can weaken the pelvic floor (not exactly something that we want during pregnancy, or at all really! )—and that was enough to convince me that there are much safer and more effective ways to help students find length and space in their lower backs. Admittedly, none of this is quite as “quick and easy” as “tuck your tail,” but ultimately, it’s more than worth it to take the time to teach good pelvic alignment to all students (pregnant or not), and to find alternatives to tail tucking (even if they take a little longer to explain at first). This doesn’t mean that tailbone-focused instructions are never useful or appropriate for prenatal yoga students—just that they shouldn’t be our “go to” each time we notice a student overarching her lower back. Is it really dangerous for pregnant students to practice a traditional shavasana (corpse pose), or supine stretch? The answer (of course!) is “it depends.” The reason why this caution is often given is that as baby continues to grow, lying flat on the back for an extended period of time can compress the inferior vena cava (an important vein which returns deoxygenated blood from the lower body back to the heart). When this happens, it tends to be pretty uncomfortable, and it’s not very likely that your student will want to remain on her back (which she shouldn’t). Always mention savasana alternatives when pregnant students are present, and encourage them to honor their bodies and to change positions if they start to feel nauseous, dizzy, or uncomfortable. Always mention shavasana alternatives when pregnant students are present, and encourage them to honor their bodies. If a student is no longer comfortable lying flat on her back, she can practice a side-lying savasana or a propped “incline” savasana instead. For the side-lying variation, students should lie on their left sides (since the vena cava is on the right side of the body). A block, bolster, blanket, or pillow between the knees may help make this position more comfortable, and resting the head on a pillow or folded blanket, hugging a pillow bolster, or covering up with a blanket are other ways that you can make side-lying shavasana extra cozy and supportive.